Discussion in 'Designers and Collections' started by khyrk, Jun 21, 2009. ONE IN A MILLION: Prada used the occasion of men’s fashion week in Milan to launch made-to-measure men’s shirts that come in a whopping one million variations. Besides three different fits - classic, close-fitting and with pleats - customers can pick and mix different necklines, cuffs, pockets and fabrics, including the brand’s archival prints. The service is now available at Prada’s Milan Via Montenapoleone boutique. The wait? Four weeks. 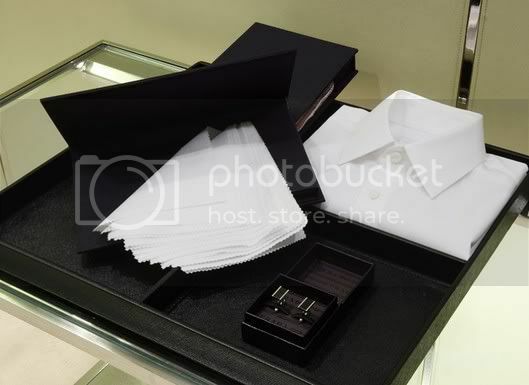 Packaging for Prada’s made-to-measure shirts. Why Prada and Jil Sander are this times offering such a service ? If you want something 'sur mesure' you don't go there, non ?! i'm curious what kind of prints they have in their archive..